TerminalEmulator is preset to match Xubuntu theme, but it is rather low contrast and I would like to use other theme. The standard ones, like Tango and Linux Colors are enough, any ideas? ~/.config/Terminal/terminalrc is responsible for the color settings that can be easily customised. Not the answer you're looking for? Browse other questions tagged command-line xubuntu colors or ask your own question. What is the “default” font for xubuntu terminals? 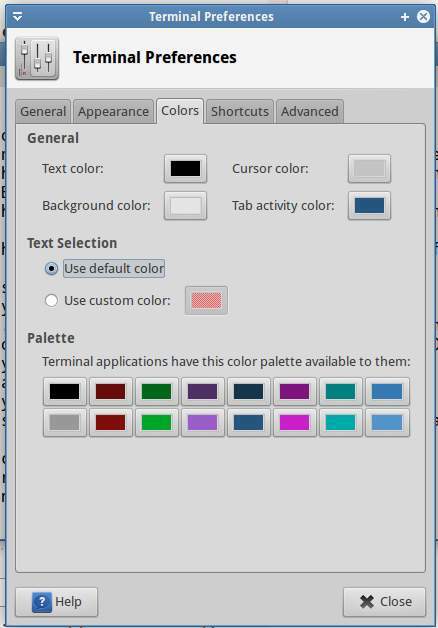 What are the standard desktop colors? How to install Xubuntu complete version from the terminal? How to find what particular fonts are used for the system GTK theme in XUbuntu? How to colorize Xubuntu13.04 terminal? How to remove shadow behind panel icons in Xubuntu?